After a brief but intriguing opening coda which sees a figure, wrapped in a dirty sheet and bound up with rope, rise from the confines of its bed only to be shot through the head, we crash-cut to New York Harbor, where a pleasure yacht haphazardly crosses through several lanes of maritime traffic, bringing a visit from the harbor patrol after several close calls almost end in a collision. Two patrol officers board the seemingly abandoned boat, and while one handles the tattered sales to put the brakes on the errant craft, the other heads below and finds a repulsive scene of rot, ruin, and an unholy stench as the place is trashed and crawling with maggots and other invertebrates covering all the half-eaten food and other items -- one of those being a severed hand found under a blanket, which appears to have been gnawed on. For now, though, the investigation into the derelict boat zeroes in on Anne Bowles (Farrow), whose father owns the not quite as abandoned as it looked yacht. But Anne claims she hasn’t seen her father in over three months and it’s been at least one month since she last heard from him somewhere in the Antilles. Meanwhile, the city coroner is wrapping up his autopsy on the dead harbor patrolmen, listing massive blood-loss following a bite to the neck as the cause of death. Of course, he’s also too busy fussing over his equipment to notice the corpse is starting to move! Also poking his nose into all of this mess is ace reporter, Peter West (McCulloch), who sneaks onto the suspect boat looking for a scoop but finds Anne instead, also poking around, before they’re both rousted by the night watchmen. But they quickly pass themselves off as a pair of ditzy passionate lovers looking for a place to screw, which just gets them kicked out instead of arrested for trespassing at a crime scene. However, West was able to abscond with a letter from Anne’s father before getting the boot, which reveals his last known location: the Caribbean island of Matoul, where he apparently contracted a strange tropical malady but has volunteered himself as some kind of guinea pig for a local doctor trying to find a cure. And so, with this solid lead, West talks his editor into sending him and Anne to Matoul to get to the bottom of all this -- only problem is Matoul isn’t cited on any chart or map. And so, the couple head to the Antilles to try and pick up on the old man’s trail, where they come upon an American couple, Brian Hull and Susan Barrett (Cliver, Gay), who are cruising around the islands on a sightseeing tour both above and below the waterline. They agree to help them search for the island, and while Hull has no idea where it is he has heard rumors about Matoul -- none of them good. Seems it’s a place the local islanders feel is cursed, thus Hull hints maybe they should heed these dire warnings and just stay away. But neither West nor Anne put much stock in native superstitions, and so, they’re search for Matoul begins in earnest. Speaking of Matoul island, we cut there next and spy a sweaty and sleep-deprived man trying desperately to raise anyone on his radio with no luck. This man is Dr. David Menard (Johnson), and when he fails to get a response the good doctor gets an earful from his permanently crocked wife, Paula (Karlatos), who begs him to get her off the island before they can get her. But he assures “they” are still clear on the other side of the island. Still, she’s heard terrible stories of horrible things being perpetrated by these somethings as this cryptic conversation continues, even accusing her husband as being behind this enigmatic calamity. Cut back to Hull's boat as the search for Matoul has thus far been fruitless. Here, Susan asks to take a break from the monotonous task for some scuba-diving and souvenir picture taking. They agree, and so Susan quickly strips down to nothing but a bikini bottom, much to the ogling West’s delight, dons her gear, and goes over the side into the crystal clear water. But after snapping several shots of the coral and tropical fish a shadow cuts across her as a large tiger shark suddenly draws a bead on the swimmer! I do believe that is how I first discovered Lucio Fulci’s Zombie (1979), when it was described to me by a fellow horror-nut as the movie where a zombie fights a shark. And while we will delve further into that notorious scene later, first things first, we gotta track down the slightly convoluted production history of the film that sprung it. 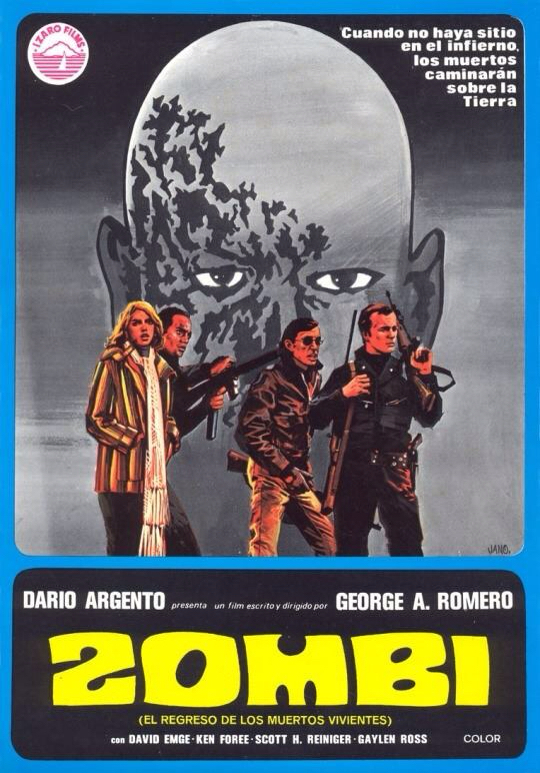 Seems noted Italian filmmaker Dario Argento was a great admirer of George Romero’s Night of the Living Dead (1968). 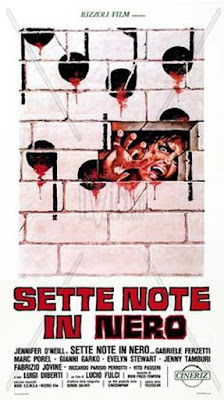 And when he got wind Romero was finally getting around to doing a sequel, Argento insisted he come to Rome to write the script at his villa with no distractions. And during the three weeks it took to produce a first draft, Argento would read Romero’s finished pages but added nothing, feeling it was fine as is. 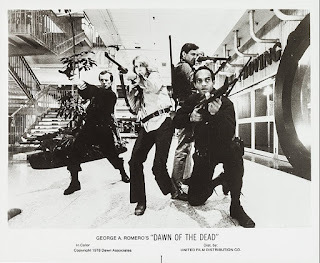 At some point, though, Argento did negotiate for the rights to edit his own version of the film for a European release once Dawn of the Dead (1978) was completed in exchange for helping secure financing for the film. And do that he did, as Argento extensively re-cut Dawn of the Dead for Flora Film, chopping out nearly five minutes, removing anything humorous to keep the emphasis on the horrific, and re-scored it with several more tracks from Goblin to make it more appealing to an Italian audience. Makes sense, right? I mean, American studios have been doing that to foreign films for decades. And so, Flora released Dawn of the Dead as the stand alone Zombi (1978), making no reference to it being a sequel to Night of the Living Dead, which proved to be a ginormous box office success. And so successful it was, Flora and producer Fabrizio De Angelis wanted to immediately cash in with a sequel. And since Romero’s Day of the Dead (1985) was nearly seven years off, and since they already kinda sorta had the domestic rights to Dawn of the Dead, De Angelis decided to exploit a quirk in Italian copyright law, which allowed any film to be marketed as a sequel to an existing work, and just made his own “unofficial” sequel, Zombi 2 (1979). 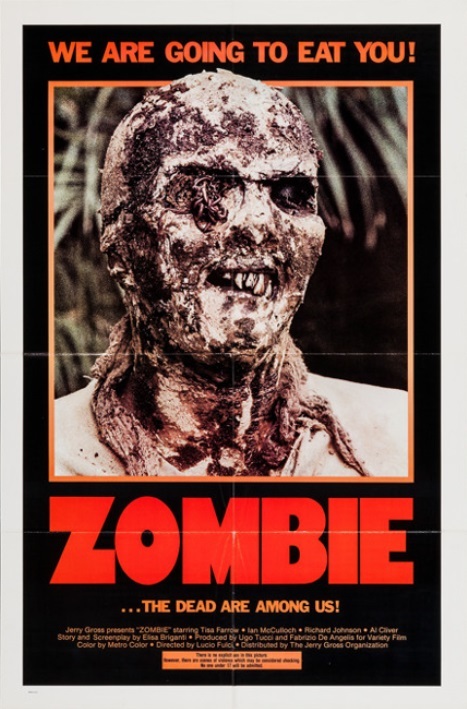 And to make this even more confusing, when the barely legit sequel was eventually sold to exploitation specialist Jerry Gross -- I Spit on Your Grave (1978), The Boogey Man (1980), for U.S. distribution, Gross lost the 2 and just released the film as Zombie (1979), which shouldn’t be confused with Zombi, which is really Dawn of the Dead, of which Zombie is a kinda sorta sequel, which is also known as Zombi 2 AND Zombie Flesh Eaters. Got all of that? Good. 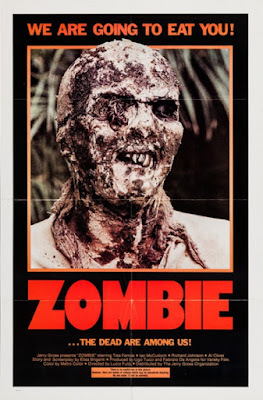 Because there’s no way in hell I’m gonna try to explain what films exactly constitute Zombi 3 thru Zombi 7 and all the assorted glommers-on and Joe D’Amato knock-offs. 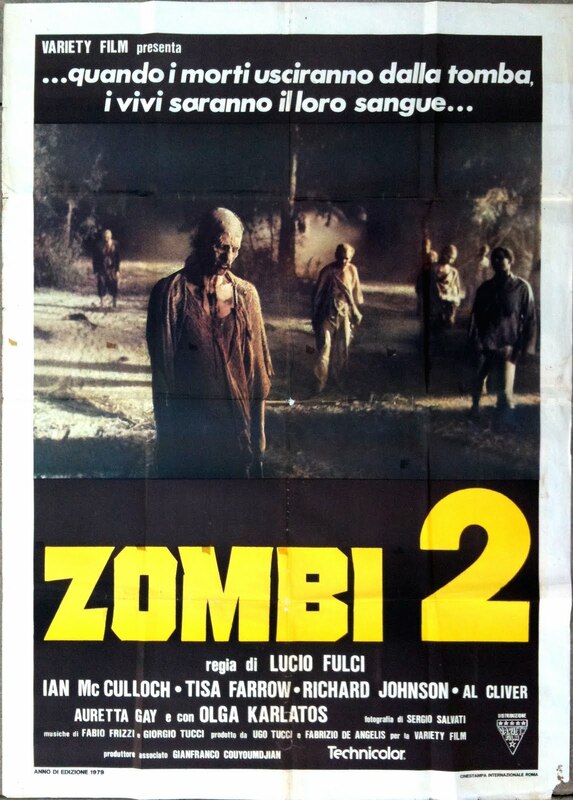 Now, there were some unsubstantiated rumors that Zombi 2 / Zombie was in production even before Romero finished his film. 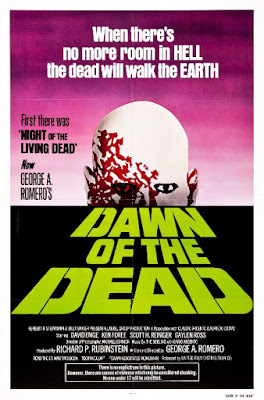 And I don’t think it’s even fair to really call it a sequel to Dawn of the Dead -- or even a rip-off, as these two living dead films are as different as, well, night and day. 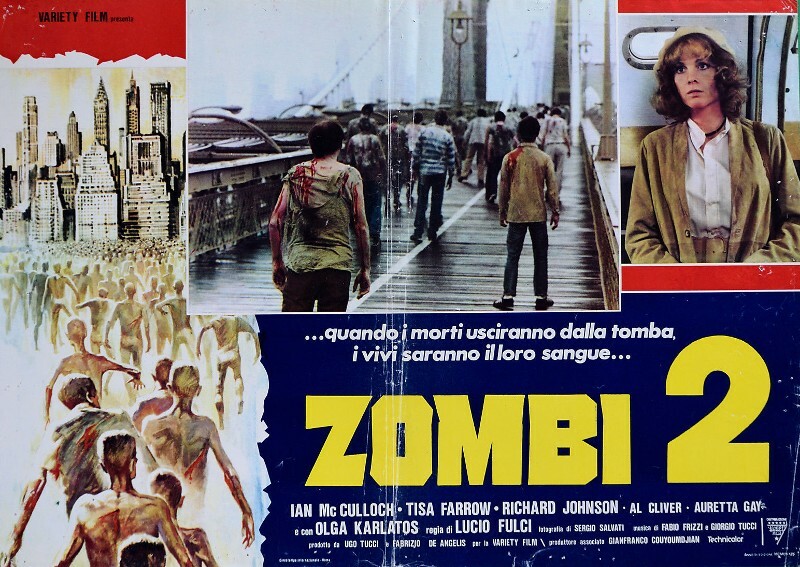 I believe these rumors can be traced to screenwriter Dardano Sacchetti, whose script for Nightmare Island was already written when it was picked up by De Angelis and retooled for Zombie. 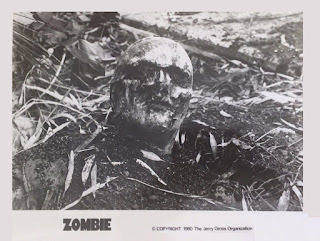 For his original script, Sacchetti was heavily influenced by The Island of Doctor Moreau and several classic zombie movies like I Walked with a Zombie (1943) and The Walking Dead (1936), returning the zombie back to its ritualistic roots in voodoo. And a lot of these notions still bleed over into the revised script as voodoo is suggested as one possibility for the current outbreak of reanimated flesh-eaters on Matoul. Sacchetti had already collaborated with director Lucio Fulci on Sette note in nero -- Murder to the Tune of Seven Black Notes (1977), which, along with Don’t Torture a Duckling (1972), got Fulci the job on Zombie because De Angelis liked the unflinching way the director handled protracted violence onscreen. 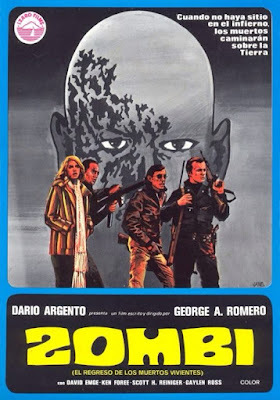 Still, Fulci was De Angelis’ second choice as director because his first choice, Enzo G. Castellari, turned him down, feeling he wasn’t cut out to direct a horror film. But he suggested his friend, Fulci, whom he felt would be perfect for the job. Turns out Castellari was a genius. And the fact this freed him up to do the completely bonkers, The Last Shark (1980), makes him even more so. 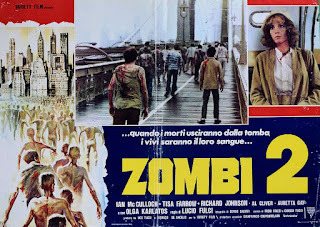 In Zombie you can definitely sense the beginning of Fulci’s shift from the blunt-force murder set-pieces of his gialli period to the eerie and ethereal hopelessness and supernatural grotesqueness of his forthcoming Gates of Hell trilogy. 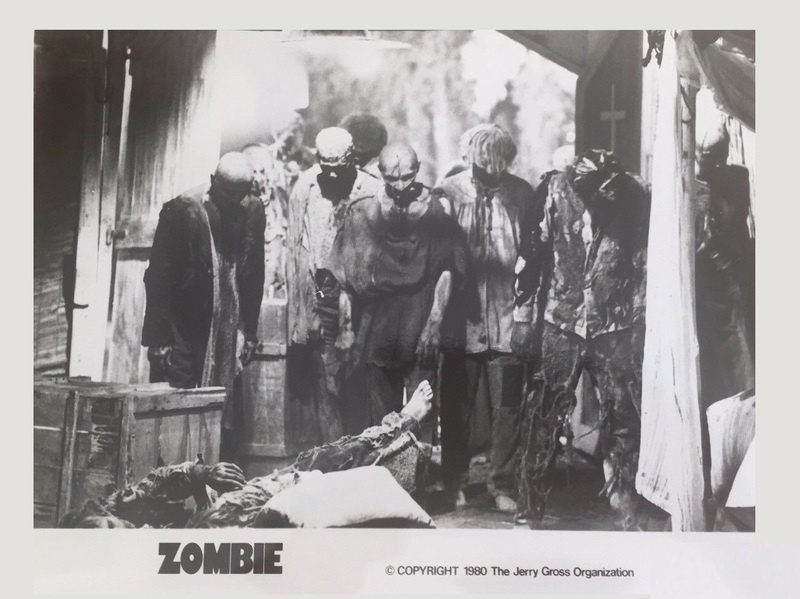 In Romero’s film you still recognize what was before the outbreak and the protagonistic quartet’s efforts to return to a sense of normalcy and their efforts to defend it to the death and beyond. In Fulci’s movie, normal has gone to hell with no hope of ever returning. Chaos reigns supreme, and death and decay permeates everything. In both films, ‘logical means to an end’ break down. But in Romero’s world it should’ve worked. In Fulci’s world, logic need not apply and don’t even bother. 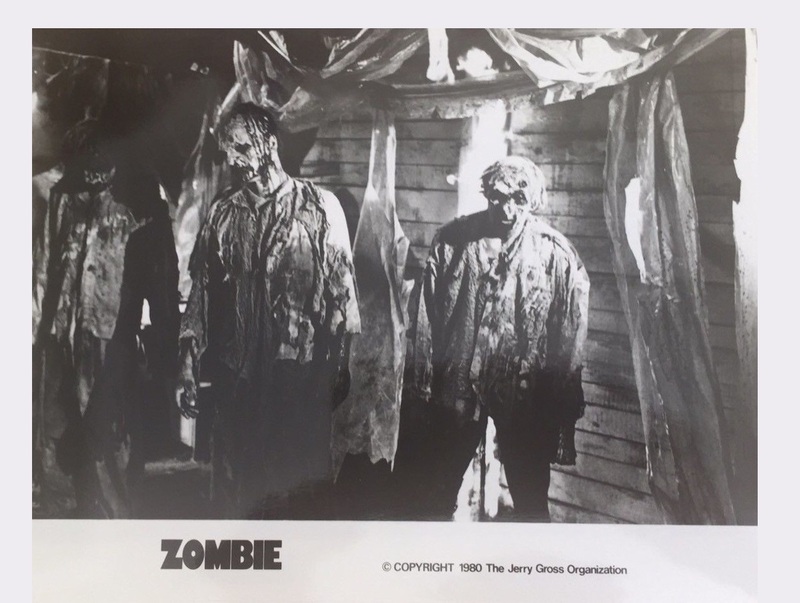 And Romero’s zombies, of course, are allegorical potshots at the Vietnam War and mass consumerism, while Fulci’s represent nothing more than death itself. For it doesn't matter how much you try to outrun them, sooner or later, there’s nowhere left to go and they'll inevitably and unrelentingly catch up to you. A perfect weapon of horror for a director prone to the “visceral and the emotional over the reasonable." Still, Zombie is far from perfect mostly due to some huge pacing issues in the first half and a script that kinda keeps contradicting itself or is maddeningly obtuse as to what caused the dead to rise on Matoul in the first place. Ostensibly, Dr. David Menard was on the island to study the native voodoo rituals. And despite his wife’s accusations, I don’t think he had anything to do with the resurrection of the dead on any mad science basis but he still might be responsible due to having pissed off some hougan or tribal leader and this is some kind of supernatural payback on the white unbeliever. One also wonders if he sent the boat that wound up in New York in an ill-fated attempt at looking for help. Again, this is pure speculation. The sound of angry ritualistic drums can be heard constantly as the doctor works in a makeshift hospital in a converted, ramshackle church with his nurse, Clara (D'Amario), as they treat the sick and Menard tries to find a scientific answer as to what is making them ill and why his patients reanimate after death. And the only way to prevent this, is to bind those about to expire in sheets and rope and then put a bullet into their brains when they reactivate. And as they bury the twice dead in mass graves, Menard asks his native helper, Lucas (Dakar), if voodoo is responsible for this unholy plague but he has no answer and only alludes to the old Romero axiom, referring to it as a legend his father once told him, saying, When there’s no more room in hell, the dead will walk the earth. Is it all as simple as that? No one can really say. 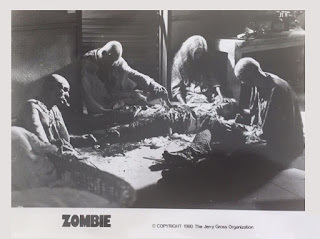 And yet it is Menard’s inability to accept the inexplicable as fact that keeps him and his wife -- and later, everyone else, on the island, making him the most responsible for what happens next, beginning with Paula being killed most gruesomely by a hoard of zombies in the film’s other most notorious scene, when her eye is slowly pierced by a large wooden splinter. Meanwhile, let’s check back in on Susan, who, you remember, was currently trapped on the ocean floor between a tiger shark and a aqua-zombie. Again, Susan doesn’t panic and is able to wrest herself away from this attacker by sawing into his face with a piece of broken coral. And once she’s free, the zombie then turns his attention on the shark. And as these two exchange several bites, with the zombie getting the worst of it, having lost an arm, Susan is able to surface and gain the safety of the boat, where she wildly relates her shell-shocked tale to a stunned audience. Now, first off, I wanna say this whole previous sequence is just incredible. It was well staged, cannily shot under trying circumstances, and will leave you baffled as to how in the hell did they manage to pull that off with a live shark of that size in open water -- unless you know or realize how they did pull it off, and then things get a bit squicky. Apparently, this whole underwater scenario with the shark attack was devised by the film’s co-producer, Ugo Tucci, and was shot without Fulci's approval or involvement. Seems Mexican filmmaker and renown cinema shark slaughterer, René Cardona Jr. -- Tintorera (1977), Cyclone (1978), who never met a shark he wouldn’t kill onscreen, was originally hired by Tucci to play the underwater zombie, but he got sick at the last minute and was replaced by one of his shark trainers, Ramón Bravo. And while Bravo claimed his technique involved feeding the shark before filming and doping it up with sedatives, if you look real closely at the footage there might have been another, more brutal safety feature involved. See, it was common practice for these kind of shark movies back then to capture sharks, dry them out or stun them, and then forcibly remove all of their teeth with pliers before returning them to the water where they’d revive. And I’ve sat through this scene five times now and I’ve yet to see any teeth. (Those may look like teeth on the bottom but, trust me, those are the gums.) And while being gummed by a shark would undoubtedly still hurt, couple that with the fact the poor fish is obviously distressed and only wants to get away during the brawl, and knowing it probably didn’t live much longer than the director’s final cut and print kinda sours an otherwise amazing sequence. And it is an amazing scene, but it definitely deserves an * and a moment of silence for Tigger, who wanted no part of this nonsense. Meantime, luck is with and against West and the others as their boat suffered a broken propeller shaft when the shark rammed them, leaving the quartet stranded near an island that turns out to be Matoul, which they discover when Menard investigates the flares they fired off. And so, he takes them all to his hospital, where he informs Anne that her father is dead (-- pretty sure he’s the one getting plugged in that opening coda), but lies about the cause and the deadly side-effect for some reason. He then offers his jeep so they can drive to the nearest village and seek a tow for their boat. Again, he is very coy about the work he is doing, and fails to mention anything about the zombies, which only makes the guy look more guilty of something. But Menard does ask them to check on Paula at their villa, which is on the way. This they do, but only find what’s left of Paula as several zombies messily feed on her corpse. Horrified, the others must fight their way back to the jeep and burn rubber. And as they try to make sense of what is happening, Hull takes his eyes off the road just long enough to not see the zombie that just stumbled out in front of them and the resulting impact sends them careening into the jungle, where the jeep is pancaked onto a tree and West suffers a nasty fracture of the ankle. Thus, the going is slow as they try to make it back to the hospital on foot before the sun goes down. Here, the group also makes the critical mistake of stopping for a respite in the middle of an old Spanish Conquistador graveyard, where they learn the hard way that it’s not just the recent dead who are coming back to life. And as the living dead unearth themselves, rise, and swarm, Susan is lost. (Which is confounding as this same girl faced down a shark and a zombie earlier and, here, went rather meekly.) Meanwhile, back at the hospital, Menard’s remaining patients are dying faster than he can properly dispose of them. And believe me, now is not the time to be losing count on who's been shot in the head and who hasn’t. Then, as night falls, the others make it back to the hospital with a whole island’s worth of zombies right behind them. Alas, this glorified hut is less than ideal as a fort as it is quickly surrounded by the dead, who start to break in. And while the living make a good fight of it with some handy molotov cocktails (-- and it might’ve been an even better effort if Menard would have clued them in to destroy the brain instead of wasting so many bullets on body shots), Menard, Lucas, and Clara are all killed during the siege. And as their refuge burns around them and the zombies continue to mass and press forward into the flames, Hull, West and Anne decide to try and make it back to the apparent safety of the boat. Unfortunately, along the way, Hull runs into the reanimated Susan, who takes a good chunk out of his arm before West puts her down. Despite this setback, they do make it and limp away in the damaged boat. But it’s only a matter of time before Hull expires and reanimates. And while Anne thinks they should put him down, chuck him over the side, and be done with it, West says they need him as evidence to back up their outlandish story. However, they needn’t have bothered as Anne tunes in the radio and receives a harried news bulletin out of New York. 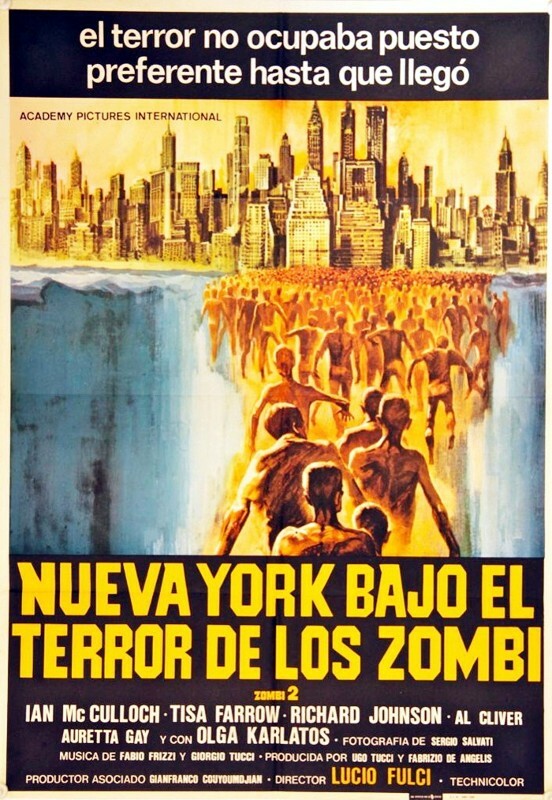 Seems the city is lost and has been completely overrun by the living dead in the interim. This broadcast is then cut short as the zombies destroy the station and eat the broadcaster. And as West and Anne listen in stunned silence, we cut away to New York and see an unstoppable army of the living dead marching across the Brooklyn Bridge to all points beyond. One of the few (but most) frustrating things about Zombie is how it treats its characters, who are smart and capable and likeable -- and much smarter and capable and likeable than their usual ilk who populate these kind of European cash-ins, until they’re not. Yep. Looking right at you, Brian and Susan. Still, the cast acquits themselves rather well under the trying circumstances, shooting in Latina, Italy, New York City, and the island of Santo Domingo. And shame on me for not realizing until this viewing that Dr. Menard and Dr. John Markway of The Haunting (1963) were played by the same freaking guy! Richard Johnson and Ian McCulloch had previously served in the Royal Shakespeare Company together in 1962. 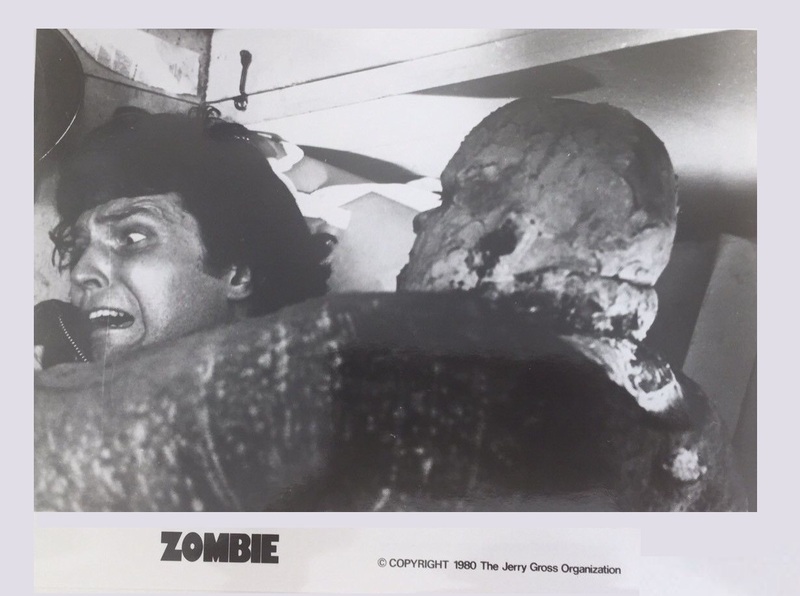 McCulloch would be at it again a year later in Zombie Holocaust -- aka Dr. Butcher M.D. (1980). As would Tisa Farrow, who would appear as the main protagonist in the equally gruesome, Anthropophagus (1980). But it’s the work behind the camera that definitely elevates Zombie well past its myriad shortcomings. 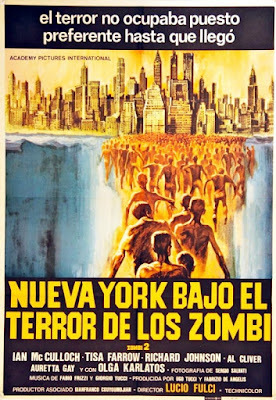 Between Fulci’s steady direction, Sergio Salvati’s eerie cinematography, and the apocalyptic production design of Walter Patriarca, the sheer impact of the film’s atmosphere and visuals is worth a spin on its own. (There’s a scene where one solitary zombie is shambling down a windswept street that is positively haunting and I get the creeps just typing this description up. Also, the scenes in New York are startlingly effective.) And then, of course, we have the amazing make-up effects of Giannetto De Rossi. I don’t think I’m going out on too big a limb, here, when I say I think De Rossi’s zombies -- from concept to execution, are the best rendered and realized zombies of ever. They are gruesome and creepy as f@ck! They are slow, covered in real worms and maggots, and caked with dirt. (To all you uncredited extras, you were all awesome and then some.) And most amazing of all is how easily the flesh sloughs off of them down to the bone, and how easily they break apart or detonate with satisfying splat and gurgle with each impact. And the damage they cause to live human tissue is equally effective and disturbing as they always seem to go for the throat. Also, eyeball trauma. Great googily-moogily just try and sit still through that scene as Fulci keeps milking the inevitable puncturing! Wow. Again, there are several theories but no explanation as to why they’ve come back and feed on the living -- which only adds to the whole surreal irrationality of everything we’ve seen. Kudos to all involved. Fulci, Sacchetti, Patriarca, and De Rossi would reunite for City of the Living Dead (1980), The Beyond (1981) and The House by the Cemetery (1981) -- that aforementioned Gates of Hell trilogy. 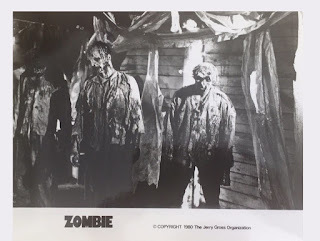 And while they push things even further, exploring a horrible other reality just outside our ability to perceive it, none of them are as raw and as effective as Zombie -- which is why Zombie is in a constant dogfight with Night of the Living Dead as my most favorite living dead movie of all time. Night is still the king, but being second on a list to that masterpiece is nothing to sneeze at -- at all. What is Hubrisween? This is Hubrisween. And now, Boils and Ghouls, be sure to follow this linkage to keep track of the whole conglomeration of reviews for Hubrisween right here. Or you can always follow we collective head of knuckle on Letterboxd. And that is that. 26 films, 26 reviews, in 26 days. Up next: a much needed break before we resume the usual nonsense. Happy Halloween, Boils and Ghouls!! !